Flexible technologies are accelerating the growth of fully-automated facilities, and it seems that automation will replace many jobs in the next few decades. Many would probably remember the scene from the iconic Arnold Schwarzenegger’s movie “Total Recall”, where he travels to work in a robotic “Johnny cab”. It was science fiction back then, but now we can see that the truth is stranger than fiction. Mercedes Benz has already launched a semi-autonomous driving system, and Uber is also investing tons of resources on self-driving automobiles. This project will probably cost thousands of people their jobs because the goal of this project is to replace human drivers with autonomous vehicles. Many optimists claim that incorporating more robots in our workplaces will lead to higher productivity and economic growth. However, some renowned scientists including one of the greatest minds of our generation, Stephen Hawking, have predicted that the machines will exceed human capabilities and possibly even trigger the collapse of human civilization. They all have a point, but machine intelligence is still a long way from matching the full potential of human abilities, so we have little to no reason to worry about mass unemployment, at least in the next 20 years. Robots can replace humans, but only to a certain degree. Back in the 1990s, the banks in the United States started automated teller machines all across the country. Although at first, it seemed that human workers were facing rapid obsolescence, because who needed people when a device could hand out cash and accept deposits on their own. However, the cost savings urged the parent banks to open new branches which ultimately resulted in the increase of employment of human workers. This is a lesson worth remembering when making bold predictions about the future of work, and the “rise of the machines”. With the uprising automation shift, people with the skills to operate, install, design, and maintain machines are becoming more available. 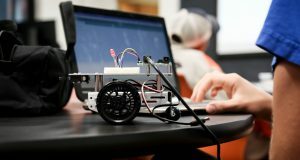 Robotic engineering is widely taught at schools and colleges around the world as a part of the general education on manufacturing technologies. Simulation packages and offline programming systems have made programming tasks much easier. In jobs that demand a lot of variability and customization, it is more difficult to implement automation. One example is the auto industry where people usually want something that’s tailored to them. Every vehicle that comes out of the assembly line has to be a little different, and it may be difficult for robots to adjust to this kind of flexibility. Humans will always be valuable workers because of the things like creativity, judgment, empathy, and critical thinking. Healthcare, education and taking care of children will always call for human touch.